I originally became aware of the most recent SWORDS AGAINST DARKNESS anthology from browsing Black Gate. Unlike the same-named anthologies put out in the late seventies edited by Andrew Offutt, this anthology isn’t concerned exclusively with what’s current in sword and sorcery, but instead acts as a crash course in speculative fiction over the decades. The anthology starts with a classic Conan tale “The Tower of the Elephant,” and moves through the decades of sword and sorcery. The editor, Paula Guran, does not stick with a strict publication, or even composition chronology when ordering the stories, but does divide the pieces into broad categories: Forging and Shaping, Normalizing and Annealing, and finally Tempering and Sharpening. To be sure, if you are already well-versed in classic sword-and-sorcery, some of the material will be quite familiar. In addition to Howard, the Forging and Shaping section includes work by C.L. Moore, Leigh Brackett, Michael Moorcock, and Fritz Leiber. Moore and Brackett, I feel, have recently been brought back into the public eye, but if you aren’t familiar with their work, then the two stories here suffice as an excellent introduction. Likewise, there is a Clark Ashton Smith story that well highlights how weird sword-and-sorcery can be. The second section shows how the genre evolved in its second stage, especially in the seventies and eighties. With selections from such luminaries Tanith Lee, C.J. Cherryh, Karl Edward Wagner, and Mercedes Lackey the tales move away from the standard tropes established by previous writers, but at the same time laying the groundwork for the writers that would follow after them. Also included in this section is the sole original story to be included in this anthology, “The Swords of her Heart” by John Balestra which reads like a classic 1970s sword and sorcery, despite being written in 2017. The final section, Tempering and Sharpening, shows where the genre is going, at least for certain writers. Favorite stories from here are ones by Saladin Ahmed, Kameron Hurley, Scott Lynch, and Steven Erickson. In many ways, these stories are less constrained by their predecessors, more willing to show alternative views and give voice to viewpoints traditionally underrepresented in the genre. Ahmed’s story in particular is a delight to read, especially if you are familiar with his THRONE OF THE CRESENT MOON novel that it ties into. While the majority of stories in the anthology would most certainly fall outside what would be considered classic “pulp,” this is definitely an anthology worthy of your attention. The fact that we’ve covered several of the authors on this blog is completely besides the point. Which, if it isn’t part of your regular reading habit, you are really missing out on. Yes, yes, Offutt included a Robert Howard piece in the first volume, but it was a piece that Offutt himself completed. I could see an argument for moving the Moorcock tale to this section, but Elric is such a foundational character in sword-and-sorcery that I completely understand why it was included in the first. This entry was posted in Pulp Consumption and tagged 2nd wave, action, adventure, anthology, c.l. moore, classic pulp, fantasy, Fritz Leiber, Kameron Hurley, Leigh Brackett, Paula Guran, Robert Howard, Saladin Ahmed, Samuel Delaney, Steven Erickson, sword and sorcery. Bookmark the permalink. 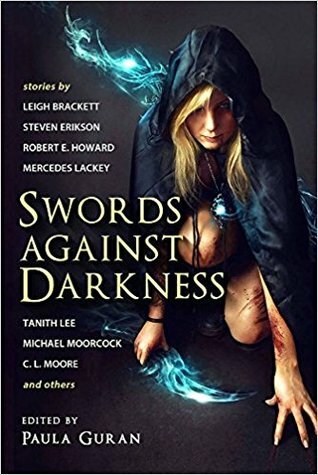 Matt discusses the latest iteration of the Swords Against Darkness anthologies, which collects stories from luminary writers of the swords and sorcery genre both past and present. Also, Issue 4 of Broadswords and Blasters is available for purchase in print and pre-order in Kindle. Looking to get into sword and sorcery? You can do a lot worse and not much better than this anthology.